Centers are on the move — and so too peripheries. As the world grows more complex different systems are claiming different territories. Distribution networks, financial hubs, industrial zones, food belts, wind farms, data centers, they all develop their own logic and territorial claim, not necessarily overlapping in what was once called the center. And our traditionally conceived centers (downtown, the Western world, global cities) are slipping away. When assessing these claims, the question is forced: Are you in or are you out? Volume #32: Centers Adrift checks out new notions of centrality, of emerging patterns and entities that influence our understanding of relationship and interdependency as a new common ground for design. An issue featuring a 900 kilometer long city challenging our notion of ‘city’ and ‘actor networks’ as challenging our notion of planning. Centers become peripheries and vice versa, new centers and new peripheries emerge. Is one better than the other and can design make a difference here? 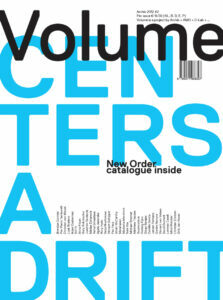 Volume #32: Centers Adrift materialized by Irma Boom and Sonja Haller includes contributions by Brendan Cormier, Pier Paolo Tamburelli, Christian von Wissel, Luuk Boelens, Arjen Oosterman, RVTR, Anne Filson, Gary Rohrbacher, Joachim Declerck, Matias Echanove, Rahul Srivastava, Agata Jaworska, Rory Hyde, Katja Novitskova, Vincent Schipper, Pau Faus, Smári McCarthy, Metahaven, Madeeha Merchant, Nele Vos, Michael Brenner, Matthew Tiessen, Supersudaca, Hedwig Fijen, Diego Barajas, Camilo García, Jeroen Toirkens, Giedre Nainyte, Vincent van Velsen, David Dunnett, Lorenzo Casali, Micol Roubini, Christian Ernsten and Dirk-Jan Visser. As special supplement Volume #32 features the New Order catalogue, edited by Rory Hyde and Katja Novitskova, speculating on new energy landscapes.